When your dentist suggests you have an oral cancer screening test, it can be a shock. You might think, "But I don’t smoke," or "No one in my family has ever had oral cancer. I don’t need that." Oral cancer is on the rise. It's no longer mostly smokers or tobacco-users; it's sexually-active people between the ages of 25 and 50. The percentage of head and neck cancers linked to the sexually-transmitted human papillomavirus (HPV) disease increased by 225% in the last two decades, according to a study published in the Journal of Clinical Oncology in October 2011. The authors predict HPV may lead to more cases of oral cancer than cervical cancer by 2020. Already, more than 35,000 people are diagnosed with oral cancer each year, and because it is often caught late, only half of those diagnosed will survive more than five years. But if it's detected early, patients have a nearly 90% survival rate. Eva Grayzel was 33 when she was diagnosed with oral cancer. "It was April 1, 1998, the cruelest April Fool's joke of my life," she said. "I ate well, exercised and had no risk factors commonly associated with oral cancer. I didn't drink and I had never smoked." Grayzel developed a sore spot on her tongue, and had a biopsy done. "My first biopsy was misread, and I had no obvious symptoms for two years," she said. "When the sore returned over the biopsy site, I was bounced among dental professionals for nine months while the sore on my tongue got more prominent and painful." Grayzel went through a radical neck dissection surgery, partial tongue reconstruction and radiation. She still can't feel the left side of her tongue, and has to chew on the right. She has severe itching along her neck scar when she eats spicy food and can't lift her head out of the sink at the hairdresser's without assistance. 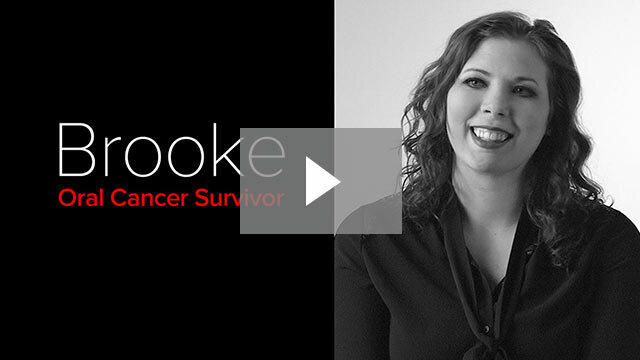 Now she's founded the Six-Step Screening campaign to raise oral cancer awareness and educate dentists on how to screen patients for signs of cancer. Another oral cancer survivor, Allen Paul, is a big believer in early detection. "Last spring, I developed a little sore under my tongue," the 69-year-old Dallas man said, "I probably waited longer than I should have, but I waited until my next dental appointment to have it checked." Paul's dentist, Dennis M. Abbott, DDS, is the founder of Dental Oncology Professionals in Garland, TX. He used a new cancer screening device called Identafi® to evaluate the spot. The device is a little bigger than a pen and uses three kinds of light to illuminate problem areas. White light checks for suspicious masses and lesions. Violet light helps identify any areas of abnormal tissue growth. The green-amber light illuminates the blood vessels around the lesions. Cancerous cells require a greater blood supply to feed them. "Identafi® allows us to magnify the scope of our visual exam," said Dr. Abbott. "If I can see more things with Identafi® than I can with my naked eye, then it's useful. In this case, all the readings came up positive, so we sent him out for a biopsy right away." The biopsy came back positive and Paul went in for surgery to remove part of his tongue. The team did a skin graft and Paul is able to talk normally still. The cancer was caught early enough that the entire mass was removed, and Paul did not need any radiation or chemotherapy. Often, somebody with oral cancer doesn't realize that anything is wrong. "A lot of it is asymptomatic," said Oliver Roberts, DMD, a dentist in Lutz, Florida. Like all Coast Dental dentists, Roberts offers his patients the advanced Identafi® screening technology to supplement the conventional physical exam. "People tend to think they bit their cheek and forget about it. Or they may be hoarse, but they don't realize it's a sign that something can be seriously wrong," Dr. Roberts said. If you have any of these symptoms, make sure you call your dentist. "Oral cancer is so disfiguring if it gets to a certain stage," Dr. Roberts said. "You may lose part of your tongue or have to have part of your jaw removed." For Paul, the Dallas man whose cancer was caught early, it made sense to have his dentist use the advanced cancer screening technology. "It’s a simple process. It's not invasive at all, so why not do it?" Paul said. "You certainly don’t want to have a lot of your tongue cut out if you don’t have to." Lutz dentist Oliver Roberts, DMD, has been a practicing dentist since 1979. He provides general dentistry services to patients starting at age 12. Services include bone grafting, dental implant restorations, extractions, periodontal disease management and veneers. His Coast Dental Willow Bend office is located at 23036 State Road 54, Suite 403, Lutz, FL 33549. The phone number is 813-909-1317.